“A tomb belonging to an high official held many titles including Mayor, Royal Seal Bearer and Prince who was called “Djehuty Shed Sou” has been discovered in Dra’ Abu el-Naga site on the West Bank of Luxor city in Upper Egypt, Minister of Antiquities Khaled el Anani announced Thursday. “It is the biggest rock-cut tomb to be unearthed in the ancient city of Thebes”, the minister said, “dated back to the Ramesside era”. Moustafa Waziri, Secretary General of the Supreme Council of Antiquities, called it “an important discovery” because it would change the historical and archaeological map of Dra’ Abul el-Naga necropolis. An Egyptian archaeological team, under Waziri, discovered the tomb – which is located to the north of Theban Tomb TT255 of Roy – after removing the debris that accumulated as a result of successive foreign excavations more than 200 years ago. As the team worked to remove the rubble on the site, it came across a complete compartment made of adobe with its well inside the courtyard of the cemetery, Waziri said, adding that it probably dates back to the period of the Ramesses, Waziri said. He added that six other tombs have been discovered underneath the courtyard, noting that one of them belongs to the king’s scribe. A group of Ushabti statues made of blue faience and wood has also been unearthed, as well as an assembled mask made of cartonnage and more than 50 funeral seals of persons whose tombs are yet to be discovered, the MoA official said” – via Luxor Times. You can read more and watch an exclusive video here. And, of the roughly 1,070 total teeth from the necropolis site that survived the millennia and excavation of their 92 skeletons, only hers showed these unusual wear patterns” – via Science Alert. Archaeologists opened the priest’s stone sarcophagus (Source: Discovery Channel). “The discovery of the “exquisitely preserved” mummy was made at Al-Ghorifa, a remote site around 165 miles south of Cairo. Archaeologists opened the priest’s stone sarcophagus in a live broadcast of Expedition Unknown: Egypt Live on the Discovery Channel on Sunday. They found the mummy covered in gold banding inside the sealed stone coffin. The mummy may also date back Ancient Egypt’s 26th dynasty, which was the last native dynasty to rule until 525 BC. The Discovery Channel confirmed the third mummy was not a high priest or well preserved. A 2,500-year-old wax head was also found and was thought to be a cast of one of the high priests.” via The Express. To read the article and watch a video clip, click here. Discovery declined to disclose the identity of the mummy prior to the broadcast” – via The Times of Israel. “An Egyptian team of archaeologists directed by Fahima El Nahas (General Director of Excavations in Alexandria) discovered a part of the west cemetery of Ptolemaic Alexandria. The discovery took place during the excavation work at the site before allowing the building of a modern wall in the railways workshops in Gebel El-Zaytoun in Alexandria. Dr. Mostafa Waziry, Secretary General of the Supreme Council of Antiquities, said that the ministry allocated the needed funds to start salvation excavation at the site by an archaeological mission of the ministry and under the supervision of Dr. Khalid Abo El-Hamd” – via Luxor Times. “High-level geophysics research provides conclusive evidence on the non-existence of hidden chambers adjacent to or inside Tutankhamun’s tomb (KV62). To solve the difficulties encountered by the two preceding surveys and provide a conclusive response, the Ministry of Antiquities in early 2016, decided to discuss the matter in the second International Tutankhamun Conference held in May 2016 and attended by a group of pioneer scholars, archaeologists and Egyptologists who on their turn asserted to conduct a third GPR systems with different technology to put an end to such debate” – via The Luxor Times. You can view a video of the Minister of Antiquities speaking about the results here. 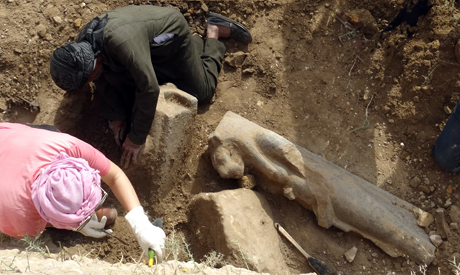 Sekhmet uncovered (Source: Ahram Online). “A collection of 27 fragmented statues of the lioness goddess Sekhmet has been uncovered during excavation work at the King Amenhotep III funerary temple at the Kom El-Hettan area on Luxor’s west bank. The discovery was made by an Egyptian-European archaeological mission led by archaeologist Hourig Sourouzian as part of the King Amenhotep III Temple Conservation Project. Mostafa Waziri, secretary-general of the Supreme Council of Antiquities, said the black-granite statues have a maximum height of about two metres. Some statues depict Sekhmet sitting on a throne, holding the symbol of life in her left hand, while others show her standing and holding a papyrus sceptre before her chest. The head of Sekhmet is crowned with a sun-disk, while a uraeus adorns her forehead. Sourouzian told Ahram Online that the discovery includes many almost complete statues with only the feet and base missing. Those statues that were not buried so deep in the ground are in a good state of preservation, he said. Others that were found at deeper levels are in a bad condition due to subterranean water and salt, which damaged the surface. “The sculptures are of a high artistic quality and of the greatest archaeological interest,” Sourouzian said. She said the importance and quality of the statues explains why they survived a period of extensive quarrying of the temple remains in the Ramesside Period, after a heavy earthquake had toppled the walls and the columns of the temple in 1200 B.C. Sourouzian pointed out that the statues are now in restoration. They will be cleaned and desalinated, as they were lying in a layer of mud and crushed sandstone. All statues of the goddess will be placed back in their original setting when the site protection project is completed” – via Ahram Online.